Whether you have been in a direct sales, party plan or network marketing company for a few weeks or a few years, you should always be trying to learn and grow as a business person, sales person and team leader. I try to read as many articles, newsletters and training materials as I can get my hands on every day and week. I have a short attention span so reading a full book is often difficult for me. However there are a few books that I have read over the years that have been a huge help to me as I have grown my direct sales business & team. Build It Big: 101 Insider Secrets from Top Direct Selling Experts by the DSWA. (Direct Selling Women’s Alliance) Build it Big was the first direct sales training book I read. It is full of training, ideas and motivation from top direct sales leaders in several industries and from multiple companies. I recommend this book to every single 1 of my team members when they start. There is also a companion workbook you can purchase that is very helpful in going through this book and also creating training for your team from the chapters and topics. More Build It Big: 101 Insider Secrets from Top Direct Selling Experts by the DSWA. This is a follow up to Build it Big with even more training and motivation from direct sales leaders. iBloom in Business: Equipping You to Build a Successful Business while Living a Life You Love! by Kelly Thorne Gore/iBloom – This book offers a practical way to help you create a vision, set goals and learn a simple plan for success in your business. Any woman in any type of small business (not just direct sales) can benefit from reading this book and applying it’s principles to starting and growing their own successful small business. EntreLeadership: 20 Years of Practical Business Wisdom from the Trenches by Dave Ramsey A great book on being an entrepreneurial leader. This book gives you a practical, step by step guide on how to grow as a leader, how to develop the leaders around you and to get your business to where you want it to go. The 7 Habits of Highly Effective People: Powerful Lessons in Personal Change (25th Anniversary Edition) by Stephen Covey. One of the best selling books ever, it is one that every small business owner needs to read to learn how to implement those 7 habits. Dare to Lead by Brene Brown: I love all of Brene’s work but this is a great one for leaders to read. Also check out The Gifts of Imperfection and Rising Strong while you are at it. Be a Direct Selling Superstar: Achieve Financial Freedom for Yourself and Others as a Direct Sales Leader by Mary Christensen – A must read book for all direct sales and party plan reps from one of the top party plan reps in Australia who is now a Direct Sales Success Coach. Developing the Leaders Around You: How to Help Others Reach Their Full Potential by John C. Maxwell I am a huge John C. Maxwell fan and would recommend pretty much all of his books. This book explains exactly what it’s title eludes to. In order to make your own dreams come true, you have to learn how to help others and develop leaders on your team. <The Leader Who Had No Title: A Modern Fable on Real Success in Business and in Life by Robin Sharma I will admit this book was a little hard for me to follow especially the first few chapters. I really loved the principle and thought behind Robin’s book and enjoy following him on social media. You will learn more ways to work with and influence others, how to recognize leadership potential and how to be more innovative and purposeful as a leader. Remarkable Leadership: Unleashing Your Leadership Potential One Skill at a Time (J-B US non-Franchise Leadership) by Kevin Eikenberry This is one of the first leadership books I read after becoming a Director/Team Leader in my Tupperware business. Remarkable Leadership is well written and lays out practical ways to learn and apply necessary leadership skills. I plan to read this book again later this year. Dare to Dream and Work to Win: Understanding Dollars and Sense of Success in Network Marketing by Dr. Tom Barrett I have not began to read this book yet but I did purchase it and plan to read it this year. I have had numerous people recommend this book to me as a must read for every entrepreneur. You can read the reviews on Amazon.com to see how highly it is rated. What about you? Have you read any of these books or do you have any other must read books you think I should add to my list? Will you be adding any of these to your own personal library? I would love if you would leave a comment below and share this post on social media too. Thank you! This is a good list! I really want to read 4 hour work week. I have had a lot of bloggers/entrepreneurs recommend it or say it helped them with their business. Thanks! I haven’t heard of the 4 Hour Work Week, will have to add it to my list of books to read. It is more blogging focused or just small biz/entrepreneur in general? 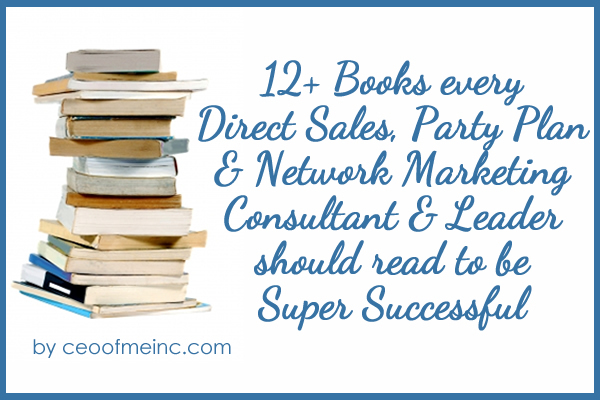 What a fabulous resource for Direct Sellers and Party Plan COnsultants….. thank you! I’m glad to see my favourite ‘The 7 Habits of Highly Effective People’ is on the list…. I also like Anne Howie ‘Let’s Get This Party Started’. Thanks Melanie! I have not heard of Anne’s book so will be sure to check it out. Great list! I just got Be a Recruiting Superstar by Mary Christensen in the mail today and I plan to start it immediately! Thanks Deb! I know you will enjoy Mary’s book! Another suggestion is The Connector’s Way: A Story About Building Business One Relationship at a Time by Patrick Galvin, a short yet powerful read. I’ll have to check that one out Ellen! Thanks for the suggestion! Hi Misty – do you know where I can find “Build It Big: 101 Insider Secrets from Top Direct Selling Experts” the ebook? Hi Jeannie, this link should take you to the ebook/Kindle version of the book. http://amzn.to/2od9Ovr I know you’ll get a lot out of the book!